We use a wide range of powerful SaaS apps – all integrated and connected to Databox – to drive our business and have a simultaneous overview of things that really matter. So, What is a SaaS app? SaaS stands for “Software as a Service,” which is a software distribution method, usually licensed on a subscription basis and hosted in the cloud. Ever since the cloud computing revolution, SaaS has become a common delivery model for most business and enterprise applications. Especially for start-ups, SaaS apps give us the advantage to do things faster, smarter, and more effectively. We thought it would be interesting to share the list of SaaS apps we use here at Databox to help grow and drive our own business. We use at least 10 more apps for Engineering and DevOps, but the following 12 are key apps for our Marketing, Product and Sales efforts. Full disclosure: none of the companies listed asked to be included and we get no kickbacks from any of the links. Intercom is a customer platform with a suite of products for live chat, marketing, feedback and support. Customer relationships are the foundation for every SaaS company and excellent customer service is one of the biggest driving forces behind it. The whole team hangs out on Intercom’s chat as much as we can, so our customers know we are always just a click away. And we love to chat with our users, guiding them through the product, or just helping them when they’re stuck. Intercom is really one of our favorite SaaS tools. One of the most crucial parts of managing customer relationships is also keeping track of how your Customer Success team is performing. Using Databox and the Intercom integration, you can keep track of the most important KPIs: Users (Active, New, Slipping away), Conversations, Average resolution time, Average first reply time, and others. Intercom also handles most of our transactional emails, during the onboarding and activation funnel. 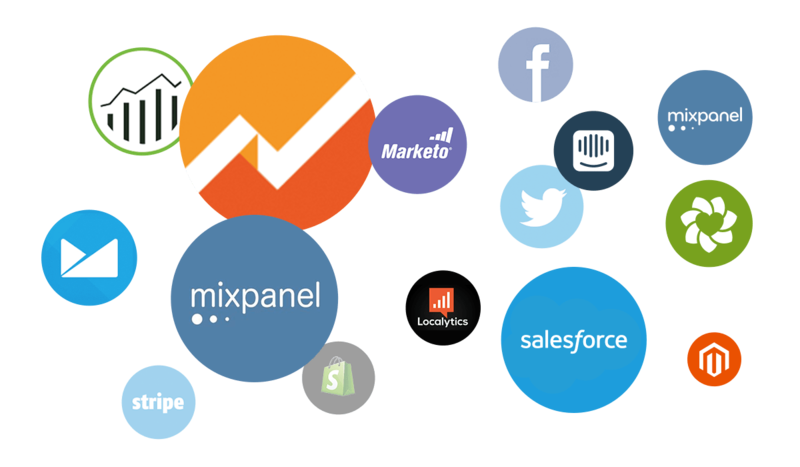 Mixpanel is one of the most advanced mobile & web analytics tools. It gives you the ability to easily measure what people are doing in your app on iOS, Android, and web. Mixpanel allows you to find out where to focus your energy while building your product. Because it’s crucial to understand how customers use our app, we keep track of custom events both in our mobile apps and web app. Beside tracking standard KPIs like Events, Users, DAU, MAU and Retention rates, we also track all segmentations and funnels (onboarding, activation) right in Databox with the use of the Query Builder (more about our Mixpanel integration). Google has undoubtedly created one of the most popular free analytics platforms that is being widely used by millions of online retailers. Although there are many advanced tracking platforms, nearly every website on Earth has Google Analytics installed. It’s the golden standard for simple but effective web analytics. We use Google Analytics for tracking website performance (Users, Sessions, Bounce rate), custom goals, and traffic analysis (referrals, search & paid traffic etc.). If you run an eCommerce business see our list of important KPIs you should track with Google Analytics. Overflowing inboxes and unnecessary meetings are a nightmare of many office lives. Yeah, Slack is the app that’s out to kill email. Everyone at Databox is using Slack, and although we have offices in US, Europe and a few remote coworkers, our inboxes are almost empty. So if teamwork is something important for your company, or you’re working with remote teams, you should definitely give Slack a try. But Slack is not just a collaboration tool; there are also various integrations that can make your product development and customer monitoring really easy on Slack. We use integrations like Jarvis, Asana, Stripe, Intercom, Rollbar, and Databox. With Databox we can also access all our KPIs right within Slack, and our Alerts, Scorecards and Weekly summaries are also delivered to Slack (more about our Slack integration). Startups know that the core of lean startup principles lies in testing, testing and more testing. Optimizely let’s you quickly A/B test your ideas and experiments, to make decisions based on real data – not just your guts. Optimizely is a great and easy-to-use tool to optimize your conversion rate. It allows you to run experiments on your site without having to bug your developer to make any changes (learn more about our Optimizely integration). MailChimp is an email marketing platform that allows you to send marketing emails, automated messages and targeted campaigns. We love MailChimp for handling our email list subscribers and sending out newsletters almost every week. MailChimp is robust and easy-to-use. Everyone can build up beautiful email campaigns using templates and we don’t need to care about visibility on different devices and email clients. We also have an integration for MailChimp to track our email marketing performances (Click and open rates) and list growth. You can start off with a free account and as your email subscriber base grows (2000+), you can upgrade to a paid account. HubSpot is an inbound marketing software platform that helps companies attract visitors, convert leads and close more customers. Although we don’t use HubSpot for marketing purposes (yet), we use HubSpot Sales and CRM to oversee our leads and communicate with our customers. New contacts, new leads and new paying customers are top level metrics we keep an eye on from HubSpot CRM and with Sales leaderboard we always know who is the most successful in our team. We have also integrated Intercom with HubSpot CRM so that we don’t lose track of all conversations and that they are accessible in one place. Whether you’re building a marketplace, mobile app, online storefront or subscription service, Stripe has the features you need to accept payments online and within mobile apps. We have Stripe integrated with Slack and Databox. Besides Monthly Recurring Revenue, which is “the Holy Grail of every SaaS company”, we also keep an eye on Annual recurring Revenue (ARR), Average Revenue per User, and the Revenue Churn. Hotjar is a website session recording and heatmap tool, which helps you find out where your users are clicking on your website, how their behavior is and where they got stuck. If you’re addicted to a great user experience, Hotjar takes the guessing out of the equation and provides great feedback for your Product and Design team. GitHub is a code hosting platform for version control and collaboration. It lets you and others work together on projects from anywhere. If you work in a team, where many people contributes to the same code, GitHub is irreplaceable. Our developers love GitHub to manage both internal development of our web app, website, mobile apps and other projects. And we also have publicly available SDKs on GitHub for pushing your own custom data to Databox. Asana is an online task management system which helps plan your days and weeks, managing the team and organizing your business. Like the founder of Asana said: “If it’s not in Asana, it’s not going to happen.” We at Databox love using Asana for planning all our tasks and projects. Once you commit to use a tool like Asana with full discipline, your life will be much easier. Everyone in the team is now able to see what others are working on, when something will be shipped, see a complete task backlog and review what our future high-level plans are. Asana will not only help you organize your project development, it will also save you tons of emails and meetings. If you’re not yet familiar with it, Databox is a business analytics platform. It gathers all your metrics from different data sources, SaaS apps, databases, or even spreadsheets, in one single place and delivers them across multiple devices: native mobile apps, browser & office screens, Apple Watch and even Slack. Databox is a hub for your data and it will help you understand how your business performs on a day-to-day basis, with its beautiful mobile dashboards and datawalls, and features like daily scorecards, alerts and favorite metrics. Improve the growth of your business, back up your decisions with solid data, and know what really matters when it matters, by signing up a free account or requesting a demo. As you can see, we depend on many SaaS apps and products at Databox and each of them helps us be more productive. To not lose focus or drown in an overflow of apps and their data, we use Databox on top of them to track the most important metrics of each, combined together in one place. Databox help us deliver key insights when something happens and – at the same time – gives us access to all key metrics any time, without spending time logging in to a bunch of apps to search for the important data.